Most of Disney’s “direct to video” (DTV) projects essentially pick up where the originals stopped. On the other hand, Beauty and the Beast: The Enchanted Christmas takes a different path. The flick doesn’t really offer a sequel to the first because most of its action takes place during the time frame depicted in the original. The program starts with a Christmas celebration that appears to be the first after the Beast and his servants returned to human form. During the gathering, they reminisce about the group's first Christmas, which occurred while the Beast imprisoned Belle in the first film. Actually, the cast of Enchanted really represents a step-up from that of the original since it features almost all of that film's performers plus it adds a few other strong actors in new parts. Tim Curry voices the villain of the piece, the jealous and possessive organ Forte, and he does so quite effectively; Curry naturally tends toward hamminess, and that capability serves him well in this broad part. (It also made me realize something that will only make sense to visitors of Walt Disney World's Magic Kingdom: Curry provided the voice of "SIR", the robot we meet during the "Alien Encounter" attraction.) Paul "Pee-wee" Reubens appears as meek but ultimately heroic Fife; it's not much of a role, but it's always good to hear from Reubens. Finally, Bernadette Peters also appears as Angelique. It doesn't help that the quality of the animation for Enchanted seems extremely weak at times. I didn't really expect it to be on the same level as the work seen in Disney's theatrical releases, but I still found the awkwardness and sloppiness of the art to be startling. Belle herself – the only human character - suffers from this problem more than the others; her movements look very stiff and clumsy. No, the animation never quite sinks down to Pokemon level, but it's surprisingly bad nonetheless. 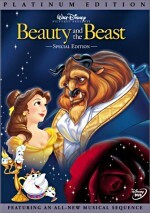 Beauty and the Beast: The Enchanted Christmas appears in an aspect ratio of 1.33:1 aspect ratio on this single-sided, double-layered DVD; as such, the image has not been enhanced for 16X9 televisions. Overall, the picture looks quite good and only shows a few flaws that mar the presentation. Sharpness generally appeared quite adequate, with an image that usually seemed crisp despite the crudeness of much of the animation. Unfortunately the weak artwork occasionally affected sharpness, as many smaller images - usually characters from a slight distance - looked soft and ill defined. This seemed more the fault of the original artwork than of the transfer, but result remained off-putting. Jagged edges and moiré effects created no problems, however, and print flaws seemed non-existent, though a little light artifacting occurred. Colors looked quite terrific, with a lush palette that appeared bright and vivid. The movie generally featured a naturalistic tone, and the DVD showed these hues nicely. The colors appeared clear and lively across the board. Black levels also were very good, and shadow detail seemed just fine. Really, it's a nice transfer that faltered only due to some slight softness and a smidgen of artifacting at times. Also positive were the surprisingly strong Dolby Digital 5.1 and DTS 5.1 soundtracks of Enchanted Christmas. Both seemed very similar. The DTS edition boasted slightly stronger bass response, but otherwise the two tracks came across as a lot alike. The mixes displayed a good sense of environment from the front channels. Music presented very nice stereo imaging, while effects showed positive spread and movement. Some effective localized dialogue appeared, and other elements seemed well placed and integrated. The effects blended together cleanly and meshed together well. As for the surrounds, they contributed a fine sense of atmosphere and added a good feeling of place. Occasional split-surround usage appeared as well, which helped make the whole thing all the more realistic. Sound quality came across as solid. Speech occasionally showed a little too much reverb, which could give it a slightly artificial flavor, but the lines usually appeared natural and warm, and they mostly fit the action well. I noticed no signs of edginess or problems related to intelligibility. Music generally sounded bright and smooth, but I felt the tunes and score needed a little more low-end power; a few of the numbers came across as slightly anemic. Effects made up for that weakness, however, as they presented nice bass response. These elements sounded clear and accurate, with no issues related to distortion or other concerns. The effects contributed a lot of rich low-end material and packed a surprising punch at times. Ultimately, Enchanted Christmas presented some fine audio for the most part. 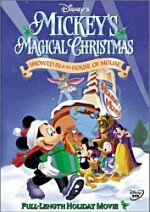 Since this special edition DVD of Enchanted Christmas updates a release that originally appeared in 1998, does that mean we find improved picture and sound? Not as far as these eyes and ears can tell. Both areas seemed positive on the old release, and I noticed nothing that appeared to improve them here. This special edition release of Enchanted Christmas replaces the old movie-only version. In addition to the DTS soundtrack, it adds a smattering of supplements. Click the Mouse gives us a “behind the scenes” featurette that lasts 11 minutes and three seconds. This provides an interesting format. In addition to the standard program, six times during the show we see a Mickey icon appear on the screen. When this shows up, hit “enter” to see short clips that elaborate on the current subject. For example, when the main show alludes to visual effects, the branching piece offers greater detail about that area. 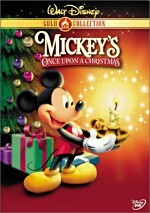 The DVD folks at Disney love their games, so Enchanted Christmas tosses in Forte’s Challenge Game. This requires you to play an organ melody to save the denizens of the castle. It progresses slowly and offers no reward for completion. If you’ve seen those video programs that show a roaring fire on your TV, you’ll know what to expect from Enchanted Environment. This provides two different fireplace options and also lets you choose to listen to music, sound effects, or music and sound effects. It’s inconsequential but kind of cute, though you’ll need to work the “repeat” button to make it useful; each clip only lasts two minutes. As the DVD starts, we encounter a mix of ads. We find trailers for The Jungle Book 2, Lilo & Stitch, Atlantis II: Milo’s Return, Beauty and the Beast: Belle’s Magical World, The Santa Clause, Winnie the Pooh: A Very Merry Pooh Year, and Beauty and the Beast. In addition, you’ll see these clips in the DVD’s Sneak Peeks domain, along with promos for The Country Bears, 101 Dalmatians II: Patch’s London Adventure, and Disney’s Princess. At times, Beauty and the Beast: The Enchanted Christmas offers some mild entertainment, but for the most part it seems pretty bland. It certainly doesn't live up to the level of the original film. The DVD itself features pretty strong picture and sound plus a minor collection of supplements. I can’t recommend Enchanted to any particular audience. 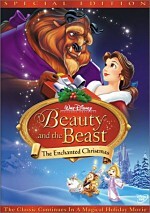 For those who don’t own the original DVD, the program doesn’t seem interesting enough to warrant much attention; even folks who love the world of Beauty and the Beast probably won’t think much of Enchanted. Those people who do like this film probably won’t want to “upgrade” to this new special edition. Picture and audio seem pretty much identical to the old release, and the added supplements don’t merit a repurchase.